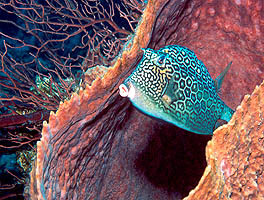 Several of the ReefNews staff visited the reefs of Belize at the beginning of March 2004. These reefs were incredible! 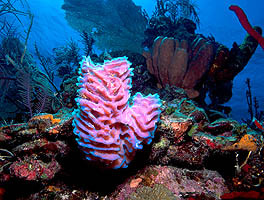 The corals were very healthy, in part because of Marine Sanctuaries to protect them. We applaud the efforts of Nekton Cruises in making this trip possible, and for their work in protecting the reefs and educating divers. This issue of e-ReefNews features two of the pictures we collected on this trip. This Honeycomb Cowfish had just finished exploring the inside of this huge Barrel Sponge, so I was able to sneak up and get this terrific picture. Click here to learn more about this Honeycomb Cowfish. The reefs of Belize were some of the healthiest I have seen. The color of this sponge was typical of the animals we saw there. Click here to learn more about this Azure Sponge.